Whether we are inhaling the aromas of curry with spices like cardamom, cumin and coriander, or tasting a pasta sauce rich with rosemary, basil and oregano, generally we simply enjoy the taste and smell food sensations. But although the word spice evokes the concept of piquant flavors and aromas of foods or drinks, most of us don’t think of the ways in which these different herbs and spices may be altering our metabolism or have a medicinal effect. There is an evolving practice of nutritional medicine which is exploring the use of phytonutrients, herbs and spices to ameliorate symptoms that would otherwise be treated with drugs. A self-described “ballerina -turned chef with a [passion] for health and spices”, Natasha MacAller, is the author of Vanilla Table, an exquisite paean to the vanilla bean. 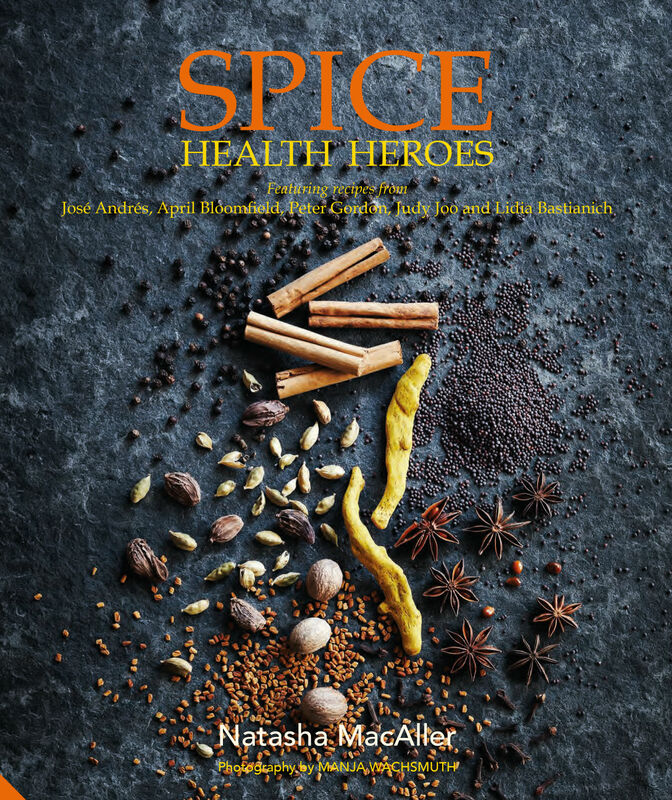 In her second book, SPICE Health Heroes she explores the history and medicinal uses of spices and presents an array of recipes exploiting their health-giving benefits. As well as her own dishes, she includes additional recipes from 21 internationally renowned chefs, and commentaries from 8 doctors who practice nutritional medicine. The spices featured and the related recipes are presented in six categories. The Immune spices which include Turmeric, Cumin, Clove, Allspice Citrus Zest and Star anise are considered to boost the immune system and also have an anti-inflammatory effect. Other categories are the Cleansing spices (Cinnamon, Rosemary, Oregano, Bay leaf and Hibiscus); the Energy spices (Black Peppercorn, Coriander, Cocoa, Nutmeg, Tamarind); the Warming spices (Chili Pepper, Ginger, Mustard, Horseradish, Wasabi); the Restorative (Garlic, Cardamon, Pomegranate, Fenugreek, Thyme) and the Calming spices (Sage, Basil, Saffron, Mint, Lemongrass). Reading the spice descriptions and the recipes as a foodie, with the accompanying illustrations by Manja Wachsmuth, was like a virtual feast. But then the scientist side of me, sent me scurrying into “googleland” looking for research underlying the categorization of these herbs and spices. It has certainly piqued my interest into researching further on the therapeutic and medicinal properties of these spices as it ties in so well to my interest in epigenetic modulators of gene expression. This book brings together culinary arts and nutritional medicine concepts in an attractive hard cover format. The only caveat I have is that the light silver colour in the smaller font sections is somewhat hard to read without good lighting. Whether on the coffee table or in your bookshelf, this book is a worthy addition to a culinary library. Cookbook Review: Piece of Cake! Gillian Tries out her Tagine! Z is for Zona Blu and the art of living long and well.